Supercharge Your Employee Engagement in 3 Simple Steps! There are more than a hundred programs and approaches developed to help organizations engage employees, however, some of the most effective ways to accelerate engagement are also the simplest and the least expensive. The Three Ways to Accelerate Employee Engagement White Paper intends to help organizations achieve their goals by providing them with powerful ways to boost their Culture of Engagement. 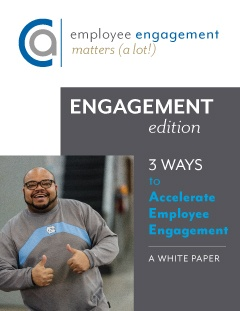 Request your Three Ways to Accelerate Employee Engagement eBook now by filling out the form on this page.